Cast : Amitabh Bachchan, Hema Malini, Salman Khan, Rani Mukherjee, John Abraham. B. R. Films: Baabul’ will be surely special because, this movie celebrates 50 years under the banner of ‘B. R. Films. 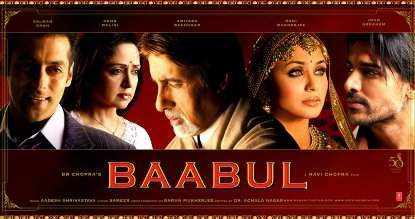 ‘Baabul’ made in a similar cast on the same lines of ‘Baghban the previous one. Baabul was keenly anticipated for many reasons - 1. 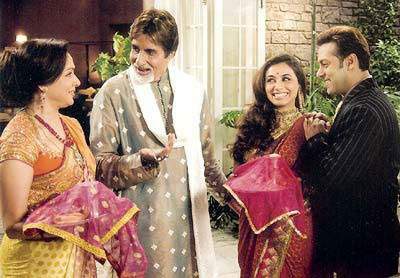 It brought back the successful team of Baghban - Amitabh Bachchan, Hema Malini and Salman Khan, 2. Additionally it starred Rani Mukherjee and John Abraham, 3. The music had hit the right chords with audience. However, if you look beyond these and try to find out what could be interestingly novel in a movie which has a pretty straight forward story. That's exactly what I wondered walking into the theater today. I already knew the story. What's next? The movie began in an usual Hindi movie format - a happy family, hero trying to win over heroine's heart, a few comic sequences thrown in between, a happy wedding, routine song n dance numbers and then suddenly the major twist in the tale, which probably everyone knows beforehand. Intermission! So, you have watched half the movie and you are still wondering why are you still around. You even know what's gonna happen post interval. What are you waiting for then, what makes you still hang around? Now, that's what I am going to tell you next - the beauty of the movie. Same as what happened three years back with Baghban, Baabul too grips you with it's very natural story telling. No fancy stuff, no over melodramatic scenes - but purely a simple story simply told. You don't feel like you are watching a movie. The scenes just roll in front of you. 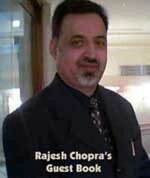 And you are trapped once again in the emotional web which Ravi Chopra weaves successfully. Add to it, you have a strong social message, which of late has become the in-thing for Bollywood especially after Rang De Basanti and Lage Raho Munnabhai. B R Films has, in fact, always made movies with strong social relevance - be it Naya Daur, Dhool Ka Phool, Aadmi Aur Insaan, Nikaah or Baghban. Here again, in Baabul, they bring up the issue of widow re-marriage. And I must say this movie has been quite successful in highlighting the need of widow rehabilitation. Amitabh Bachchan never ceases to surprise. He is superb yet again in a role written especially for him. He does not have much meat in his role pre-interval but then that's more than compensated in the second half, which totally belongs to him. Another winning performance. Rani Mukherjee, too, deserves full marks. She enacts her role quite convincingly and beautifully. She has emerged as the true Rani (queen of hearts)! Salman Khan dominates first half of the movie. Well at ease, his performance is very natural and impressive. His appearances in the second half, too, would be liked by one and all. John Abraham gets more scope in the second half, which he grabs with both hands. Good to see John in such a nice guy's role. Hema Malini looks amazingly beautiful for her age. But her role is not that strong as it was in Baghban. However, she enacts her part quite well. Om Puri has a small role in which he tends to overact. Wonder why does he do such small roles. Rajpal Yadav is terrific in whatever little scenes he gets. Sarika makes a surprise comeback. She is brilliant in a small but significant role. Aadesh Shrivastava's music is soulful. The title song 'Kehta hai Baabul' sung by Big B himself will leave many audiences with moist eyes. Wedding night song 'Baawri Piya Re' is picturized beautifully on Salman and Rani. 'Come on come on', 'Har manzar', 'Bebasi dard ka aalam' - they all fit well into the story and look good on screen. The beauty of the movies lies in its simple narration, strong performances and good music. However, the pace of the movie slacks a lot post interval. And you have a few lengthy dialogues which make the movie move quite slowly until the excellent climax scene. If you can bear the slow proceedings of the second half, then Baabul could be a good watch. And if you are a Big B or Rani fan, then probably you won't even mind that slow pace. It gets my *** stars. Feel free to post your comments.There is also a planning an emotional film, apart from a period piece called ‘Mitti’. They are still scripting on making of ‘Mahabharata’ on the big screen. The casting is yet to happen.